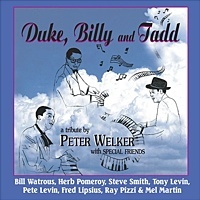 Jazz with a conscience is the best description for Peter Welker’s debut on Brownstone Recordings. WE’LL BE TOGETHER AGAIN is a collection of mainstream jazz classics first recorded in the 20s and 30s, with Peter Welker providing a conscientious rework and more than enough breathing room for their cool, soulful comeback. The Berklee trained and famed North Beach Jazz Workshop bandleader, arranger, and multi-instrumentalist, recorded the entire CD “live” in the studio, with such talented guests as trumpet great Herb Pomeroy and saxman, Fred Lipsius playing simultaneously with Peter’s 10-piece Big Band. 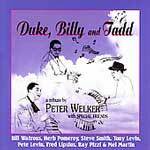 The title track opens the set with Welker on flugelhorn and Fred Lipsius on piano. This melodic tribute to Welker’s mother and musical inspiration, his son, Jacob and Lucille Marsh, daughter of drummer George Marsh, is emotional and portrays the depth of Welker’s talent and love for his natural and musical families. The song is reprised with Welker on piano and Lipsius on alto sax, giving finality and seamless power to the memorial. Herb Pomeroy’s trumpet with plunger solo wails the essence of forgotten sentiment on “Gee Baby, Ain’t I Good To You,” with the same flair he showed when he gigged with Charlie Parker, Stan Kenton, Duke Ellington and Stan Kenton. Peter later re-communicates “Moment’s Notice,” the John Coltrane composition, with a blazing arrangement featuring dynamic solos by tenor saxman, Bennett Friedman and guitarist Randy Vincent. Peter Welker expresses his jazz conscience on WE’LL BE TOGETHER AGAIN with a first take you don’t want to miss.